An electronic cigarette or e-cigarette is a battery-powered vaporiser which simulates cigarette smoking by producing an aerosol which resembles smoke. It generally uses a heating element that vaporises a liquid solution known as e-liquid. E-liquids usually contain a mixture of propylene glycol, vegetable glycerol, and flavourings with or without nicotine. In contrast to cigarette smoking, the vapour of an e-cigarette is not the result of a combustion process and is believed to have much lower health effects. However, the risks of e-cigarette use are uncertain which is due to the limited amount of scientific data regarding their health effects related to the variability of vaporisers, e-liquid ingredients and their quality. Dartsch Scientific has focussed on the experimental animal-free evaluation of e-liquids. This is done by using a specially designed smoking apparatus which allows to vary the frequency, length and the depths of the puffs. The vapour (or cigarette smoke) is piped into an aqeous solution which is used to test the acute and long-term toxicity with cultivated human lung cells as well as the mutagenic potential. Moreover, Dartsch Scientific is not only doing contract services, but is also doing research in this field and regularly publishes new results in scientific journals or as forum articles (e.g. liquid news). Effect of an aqueous extract of tobacco smoke on vitality of cultivated human lung cells. Within 4 hours after application mitotic and migratory activity of the cells is completely inhibited. 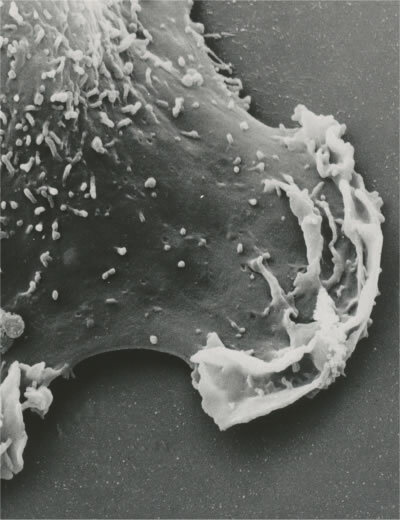 Therafter, cells are rounding and detaching (6 hours) and finally cell death occurs due to a destruction of the cell membranes (10 hours). The cytoplasm is washed out of the cells ghosts and can be detected as dark spots between the remaining cells. All pictures show the same field of view under the microscope. Single pictures taken from a time-lapse videographic sequence at phase contrast. 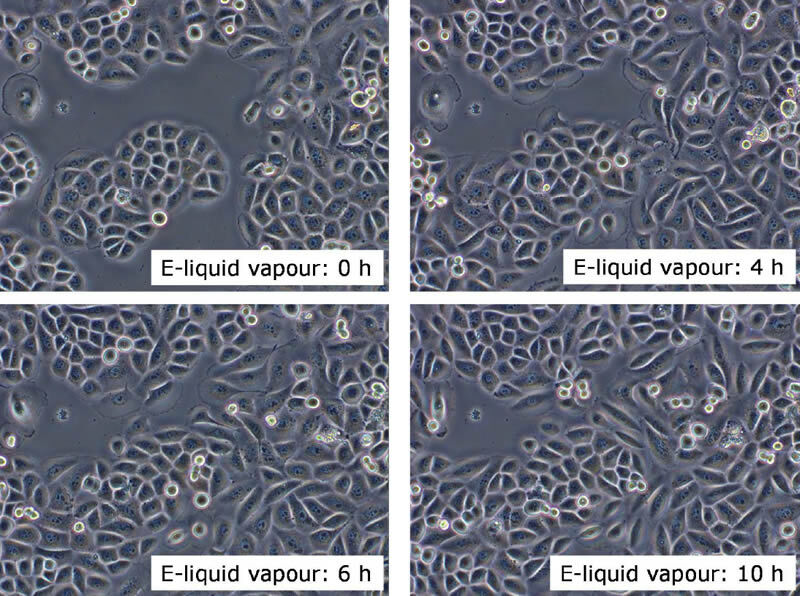 Effect of an aqueous extract of e-liquid vapour on vitality of cultivated human lung cells. 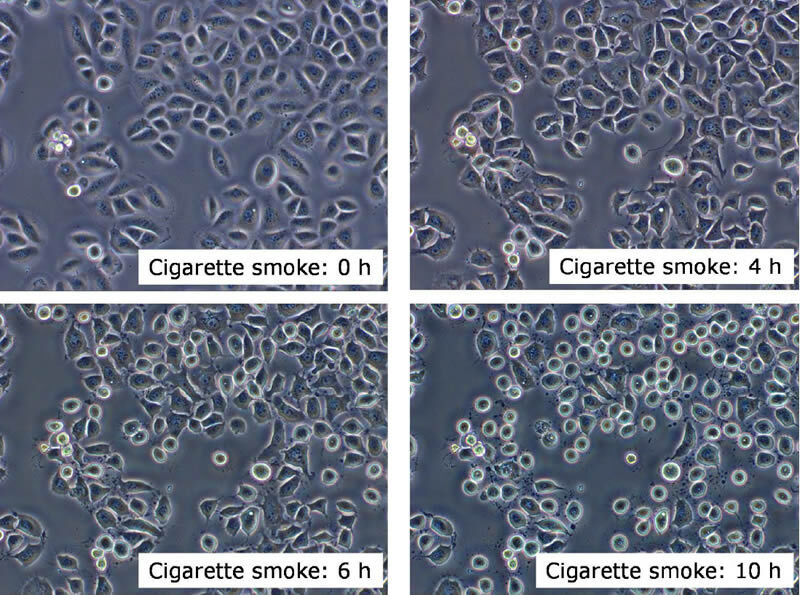 In contrast to cigarette smoke, this extract does not influence mitotic activity of the cells. Thus, the number of cells increases subsequently with time. The rounded cells in the pictures represent mitotically active cells. The cell population has a vitality index which does not differ significantly from the untreated controls demonstrating the considerably lower acute toxicity of e-liquid vapour in comparison to cigarette smoke. All pictures show the same field of view under the microscope. Single pictures taken from a time-lapse videographic sequence at phase contrast.